The Los Angeles Unified School District faces big problems. Magnet schools and second language programs have failed to slow declining enrollment; each of the 12,000 kids who pulls out this year means less state funding. The sprawling bureaucracy seems unable or unwilling to respond to chronic bullying centered in the elementary schools. L.A. United is in the peculiar position of raising its budget — most recently to $7.5 billion — while still having to cut back support personnel. L.A. Unified requires strong, decisive leadership by an education expert in it for the long haul. The last thing the district and its 640,000 students need is a narcissist dilettante with one agenda: prettying up his resume. But that’s what it’s getting in the form of Austin Buetner. The shadowy 58-year-old hedge fund billionaire and philanthropist, a self-declared political nonpartisan (but Bill Clinton ally) who began accruing his fortune making shady investments amid the ashes of the collapsed Soviet Union under Boris Yeltsin and co-founded the shady boutique investment and consulting company Evercore Partners, recently got the nod from the school board to take charge of L.A. United’s nearly one thousand schools as superintendent. Scratch the thin surface of Beutner’s resume, however, and what you find is a Hillary Clinton-like predilection for failing upward. Beutner’s first major foray into public service was as deputy mayor, but he only lasted a year at City Hall. He quit to run for mayor, but gave that up when it became clear that his candidacy had fewer takers than New Coke. In 2014 Beutner, who had no journalistic experience and as far as we know has never even delivered a newspaper, was named publisher of The Los Angeles Times, following more than a decade of brutal budget cuts, declining circulation and diminishing relevancy. No one but the man himself knows why he wanted the job; Southland political observers theorized that he wanted to leverage the editorial page to run for mayor again or perhaps for California governor. To be fair, no one man could have fixed what ailed the Times after its long gutting — but if such a miraculous creature existed, it wasn’t Austin Beutner. The problem as always for Beutner is that while he knows how to slap backs and twist arms in the toniest corridors of power, he has no natural political constituency amid the electorate. He “lacks…name recognition,” the Times drily reported during Beutner’s aborted 2011 mayoral run. Disclosure: Violating journalism’s traditional wall between the editorial and business sides of the operation, Beutner fired me as the newspaper’s editorial cartoonist as a favor to his biggest political ally, LAPD Chief Charlie Beck, because I had made fun of the cops. Overeager to please the fuzz, he even published a pair of articles about me that pretty much defined the word libel. I’m suing him and the Times for defamation and wrongful termination. Just over a year after taking the helm at Times Mirror Square, Beutner brazenly attempted a failed boardroom coup to seize both the Times and the San Diego Union-Tribune from the clutches of the Chicago-based Tribune Publishing (now known as Tronc). The Tribbies were so appalled that they ordered him unceremoniously removed with his banker’s box full of office supplies, turning off his Times email account so he had to send his farewell via Facebook. Now this creepy dude is running the schools. Which prompts a few questions. Will he last more than a year this time? Will there be parent-political blowback from the, to be charitable, less than transparent way that he won the support of the school board over Vivian Ekchian, the incumbent interim superintendent and career educator? In other words, who knows what Austin wants? The most obvious answer is that Beutner is a wannabe political animal who recognizes his biggest political problem: no one knows who he is. Being perceived as having turned around the schools might be leveraged into a mayoral or even gubernatorial run. Perhaps he’ll want to connect his business allies to lucrative contracts supplying the district; if so, he would merely be following up such fiascoes as the district’s 2013 plan to issue iPads to every student, which devolved into scandal. Beutner is a proponent of charter schools, but he faces a dilemma there: every student who transfers to a charter school takes away more revenue from the traditional institutions. The Beutner-aligned Southern California media universe isn’t spilling much ink on the aftermath of the Ekchian snub. But a lot of parents, not to mention women reveling in the #MeToo movement, felt rubbed the wrong way by the appointment of a rich white male educational neophyte over a woman with 32 years of experience working within L.A. Unified, where she began as a teacher assistant. “The man you’re about to choose has no history of success anywhere,” warned ex-school board president Jeff Horton. “What that says to all of the educators that you depend on to deliver your product is, ‘We don’t really care whether a person knows about education. We have other criteria — which are connected with our donors and our backers.’” The majority in the 5-2 vote received a total of $15 million in donations from the charter lobby. 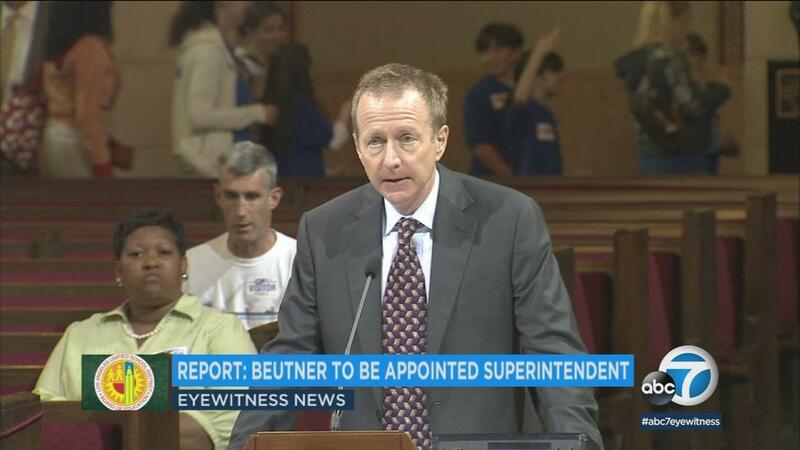 Here’s the rub: even if Beutner somehow manages to make a dent in L.A. Unified’s longstanding problems, there’s no metric in place to judge success that everyone agrees upon. Knowing Beutner — as you can imagine, I’ve studied him closely — I’d lay better-than-even odds that, as ever in search of a quick score to pump up his political prospects, he’ll throw up his hands and walk away again before long. This entry was posted in Blog, Columns and tagged Austin Beutner, billionaire, Corruption, education, Evercore Partners, Lawsuit, los angeles times, Los Angeles Unified School DIstrict, Nepotism, schools, superintendent on May 27, 2018 by Ted Rall.